Forty days and nights of prayer are under way on top of Croagh Patrick. People from all over the country have signed up to climb and do prayer and adoration in 24-hour shifts, for the intention that God will renew Ireland. Four men, who met through the Legion of Mary and at a rally, felt called to prayer given the situation in Ireland at the moment. “Jesus himself went for forty days to pray in the desert. 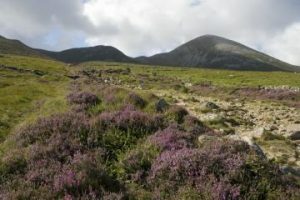 As far as we are concerned as Irish Catholics, this is our desert here,” John Carlin said, speaking to catholicireland.net from the top of Croagh Patrick. They sought a venue and came up with the idea of the mountain where St Patrick himself is said to have spent 40 days and nights in prayer. They have one special prayer intention – the referendum on the Eighth Amendment. “Many people, of all faiths and none, strongly support the protection of life from the moment of conception to natural death,” said John Carlin. He and Damien Richardson, Tim Jackson and David Mooney, who were on Croagh Patrick on 18 April, and all those who join in over the 40 days and nights, want to give a tangible expression of their support for life. “St Patrick chose Croagh Patrick as the site of his vigil of dedication, so we have followed his leadership and offered all those who wish to assert their personal commitment to the value of all life an opportunity to take part in this peaceful demonstration,” he explained. They also want to give expression to the “enduring dedication” of so many who live on the island of Ireland and who value families that bind together age groups and communities. The 40 days began on Tuesday 17 April 2018. 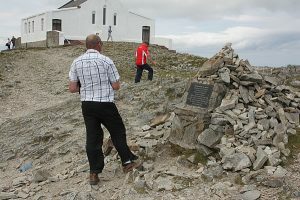 Those willing and able to climb Croagh Patrick and to spend time in prayer are welcome. Croagh Patrick, situated 8km south west of Westport town, is known as “The Reek” and is recognised throughout the world as a pilgrimage site. The Book of Armagh, a manuscript written in the 8th century, states that Saint Patrick fasted on the summit of the mountain for 40 days and 40 nights in the year 441 and also built a church there. Every year, on the last Sunday in July (“Reek Sunday”), Mass is celebrated every half hour from 8.00am to 2.00pm on the summit. Depending on weather, up to 25,000 people climb the mountain, with some pilgrims climbing barefoot.